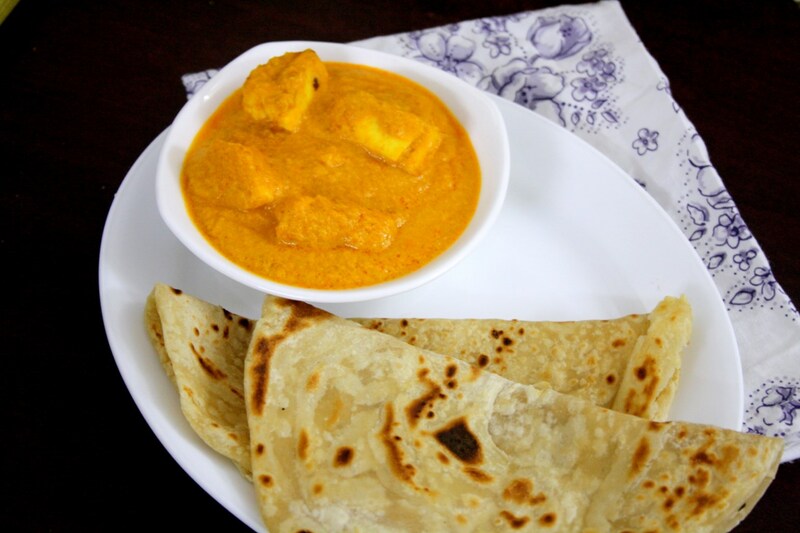 I know sharing a quick version of a paneer gravy comes as no surprise to many of you. I still will go ahead as I know this is one sinful and delicious gravy not to be missed out. 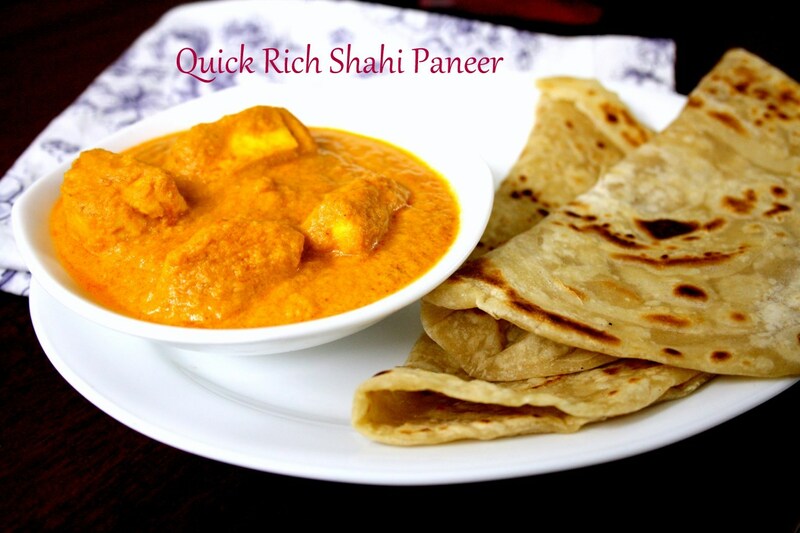 I have a load of rich shahi paneer gravies already on the blogs and one more seems just right, don’t you agree?The origin of this gravy came about in the most interesting way, the period was not though. Yes it was during the floods in Madras during Dec, 2015, that I ended up creating this recipe, based on my journey through making Paneer gravies for my kids. As I said in my previous post, during that long enforced vacation, we were out of ideas on what to make for the kids. It was a vicious cycle of dosa getting repeated itself, with some handful of dishes. One evening, while it was a regular subji roti, boys refused to eat, saying they wanted something different. Their different sabzi was naturally Paneer. While the elders at home went about eating their meal, I said I would go about making something for them, with the warning that it is going to be a quick one and not exactly what they are used to eating. They were okay as long as it was paneer gravy.Since I was focus on making the gravy and nothing else on the hand, I made everything on high flame, just under 20 mins. The gravy was instant hit and has been repeated over many weeks. Each time I timed it and saw that it varies with 20 to 30 mins depending on how focused you are on making this gravy. For all the instant type this is, you surely need to be stocked with few things. Else it might take a little longer. However it is still such a sinful gravy. I finally clicked the step by step pictures when I realized that this is something I should share with you all. I always stock this and use for all my gravies. Two trays of these frozen cubes last me a month or so and is as fresh as it was when ground. Paneer is always stocked at home, it stays fresh for nearly 4 to 5 days. I mostly use it within two days of making. MW a cup of water for soaking the cashews. 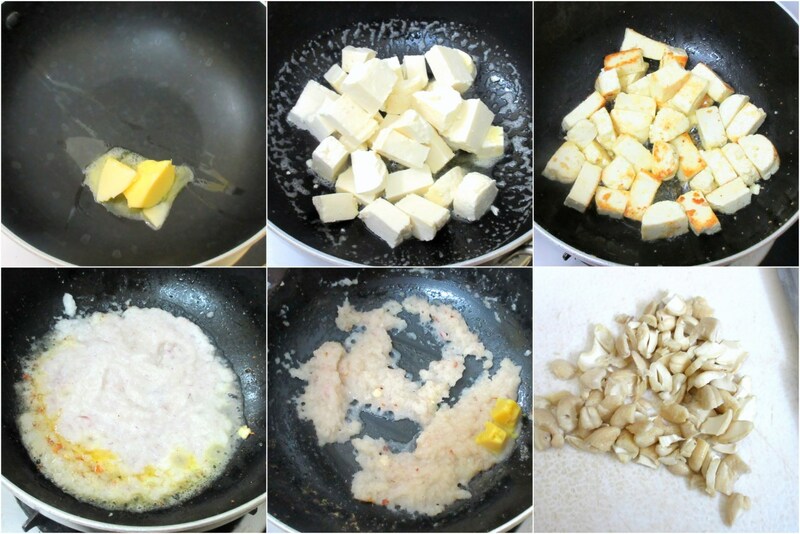 Heat a non stick pan with butter, saute cubed paneer pieces till golden, remove. In the same pan, add the oil, add onion puree, high keep stirring. When it turns brownish, add the ginger garlic cubes. Saute well. Drain the cashews, chop fine and grind to a smooth paste long with tomatoes. Add this to the pan and keep stirring on high. Make sure it doesn’t get burnt at the bottom. Now add salt and turmeric powder. Normally when adding milk, its best to add salt in the end. However in this case I went ahead and added. Simmer for 2 mins, add the spice powders and combine everything. Now add the milk and gently mix in. Have the lid handy, if required cover for 2 mins. When it starts boiling add the cream and mix everything. Finally add the crushed kasuri methi and 1/2 tsp butter. No water is added to the gravy, so its very thick and creamy. If required you can add. Take care in adding salt before milk as it might curdle the milk. Adding cream or butter is your choice, however this is a very rich gravy. So it is needed. In the same pan, add the oil, add onion puree, high keep stirring. When it turns brownish, add the ginger garlic cubes. Saute well. 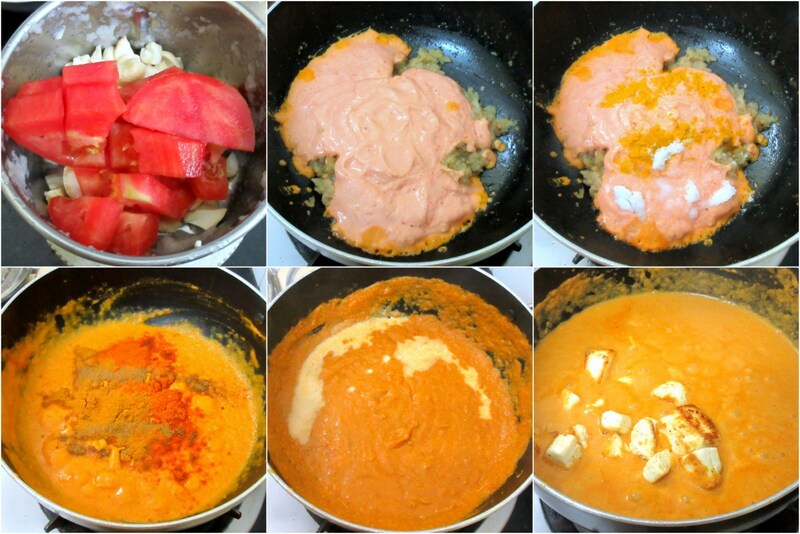 Drain the cashews, chop fine and grind to a smooth paste long with tomatoes. Add this to the pan and keep stirring on high. Make sure it doesn't get burnt at the bottom. Very sinful ! Thats a nice version Valli ! 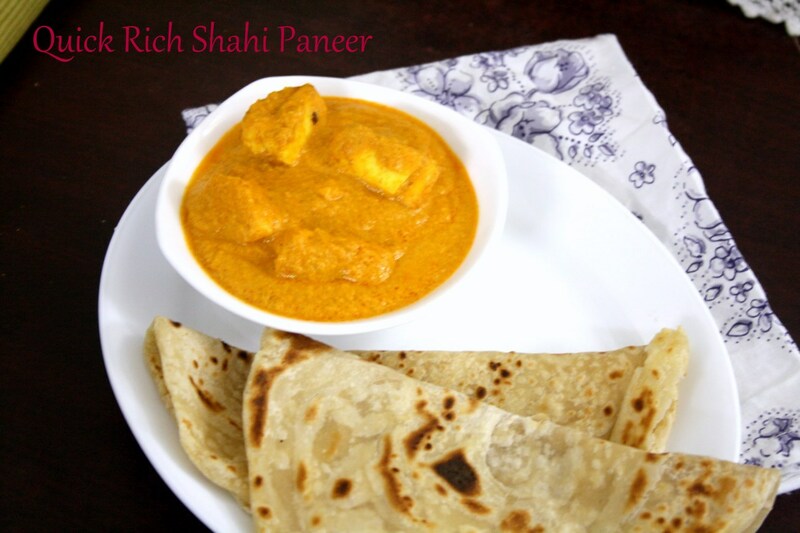 Glad the boys enjoyed the paneer , we are always in search of delicious quick recipes . Looks like the boys did not care how you cooked it, as long as it was paneer. Gravy looks rich and creamy. I love these kind of quick curries.Too tempting. Kids would live it for sure,tempting and rich paneer dish. Very nice quick version. I have some paneer and need to try this out..
Am like your boys, anything cooked with paneer i can die for, shahi paneer rocks. Sahi paneer looks inviting.. Nice curry with roti or rice. Love your quick paneer subzi. Infact I loved all your quick recipes this week. Bookmarked them all to try!! Indeed a quick version Valli. Such a creamy delight.